It’s rarely so clear to me that Erin has no fundamental appreciation for children’s media that’s actually aimed at children. Because I really enjoyed watching this. Okay, a lot of it was laughing at bits that weren’t necessarily meant to be funny, and some of it was laughing at Erin, but that is enjoyment nonetheless. So, I’m fine with Darby, and I’m fine with trying out different sorts of plots. So when Darby turns to the camera and asks us to play along, or there’s a musical snippet that clearly repeats in every episode, I tend to just go with it. There are aspects of this that are pretty bad, so far as the logic of the plot goes, and the weird baby-lisp British accent of the little reindeer, but I just found it hilarious. And the songs! The songs are by turns sweet and utterly ridiculous. Especially the singing snowmen! They were awesome! “You don’t have to sally much forth-er” rhymes with “You can’t go very much north-er”! That’s amazing! Kudos! So yeah, if you can approach this with the right mindset, I totally recommend My Friends Tigger & Pooh ‑ Super Sleuth Christmas Movie on the level of: Kinda Bad, Kinda Sweet, All Hilarious. 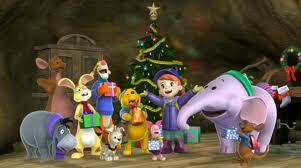 And Roo’s friend Lumpy is a Heffalump, Erin. Weren’t you paying attention?